Preheat the oven to 350°F (177°C) and grease a 9-inch square pan* or line with aluminum foil or parchment paper, leaving an overhang on the sides to lift the finished blondies out (makes cutting easier!). Set aside. In another medium bowl, whisk the browned or melted butter and brown sugar together. Once completely combined, whisk in the whole egg, egg yolk, and vanilla extract until combined. Pour the wet ingredients into the dry ingredients and gently whisk until combined. Fold in the butterscotch morsels and walnuts, if using. The batter is very thick. Evenly spread batter into prepared pan. Sprinkle with sea salt. Bake for about 35-38 minutes, or until a toothpick comes out *mostly* clean. 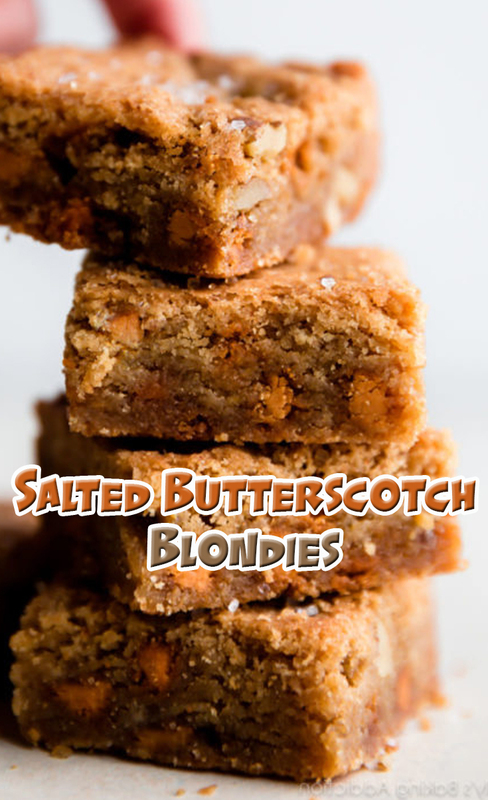 Remove from the oven and allow the blondies to cool completely in the pan set on a wire rack before cutting.